I walk frequently for exercise and fresh air on the campus of my alma mater, Eastern Mennonite University. One day I spied something new next to a bus stop. It was a little shed for books. So cute! Such a perfect and great idea, I wonder who thought of it. Maybe this will help me find out. 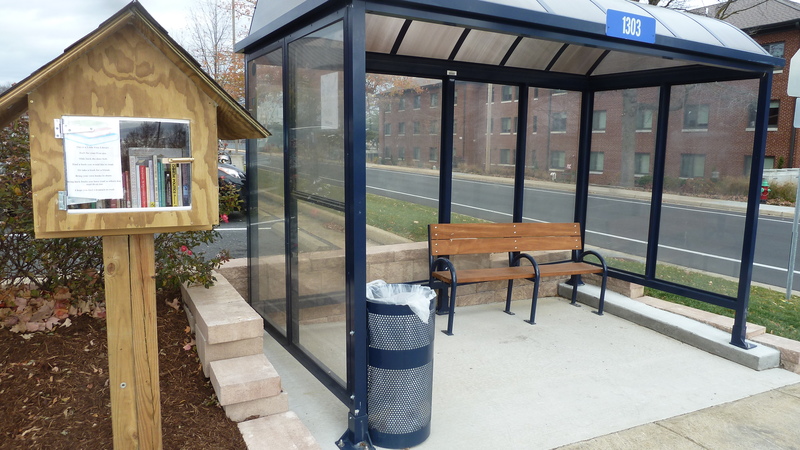 An instantly accessible and amazingly trusting little library. With no due date. Anyone can take or give a book. 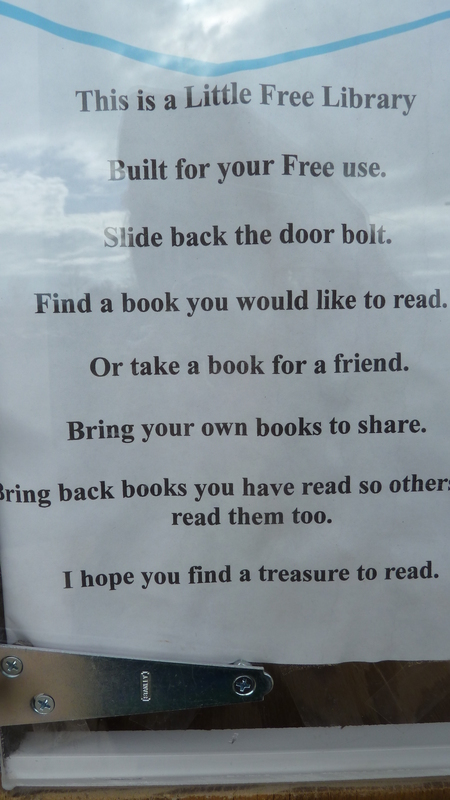 You can keep it as long as you like and return it or bring other books you no longer want on your own shelves. It. Is. So. Cute. I just had to write about it. I wonder if there are more around campus or town? Or have you ever seen anything like this near where you live? So far I have taken three books, returned one, and put in four or five myself. I get lots of free books as a syndicated columnist, sent for possible review. A new home for the titles I can’t give away at the office. The first book I took was a disappointment, so I took it back after a few weeks. 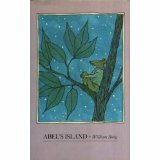 My favorite book so far, is an absolutely stunningly written story, Abel’s Island by William Steig, with drawings. It’s stamped as removed from the Moorefield (WV) High School Library, so maybe it shows up on high school English class reading lists, but it is a great book to read to younger children. It received the 1970 Caldecott Medal and Newberry Award. The plot revolves around a mouse who gets swept away from a picnic in a rain storm to an island, away from his beloved wife, Amanda, and how he tries, and tries, and tries to escape and return home. 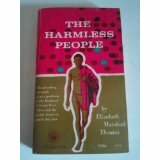 A book I’m reading now, that I would never never never have found or ordered anywhere else, is an obscure older book from the 50s written about the “Bushmen” of of the Kalahari desert in Botswana and South-West Africa by Elizabeth Marshall Thomas called The Harmless People. I’m always fascinated by the idea that there are people on this planet who live without all of the “necessities” of modern life and have no electricity, running water, cell service, and don’t know or care that Obama is President of the U.S. So even though the book describes that culture as written in 1958, I have no doubt that there are still people living much as the author describes from her time living among the Bushmen. Books can help you travel the world—or just inside the marvelous imagination of another writer or illustrator. Like the sign says, “just slide back the bolt on the door.” Your mind can be opened to new experiences, thoughts, places, dreams. And now I can get a free trip anytime I pop by the little book shed. Looks like something my husband could have come up with. Do you have a source for free or very low cost books? 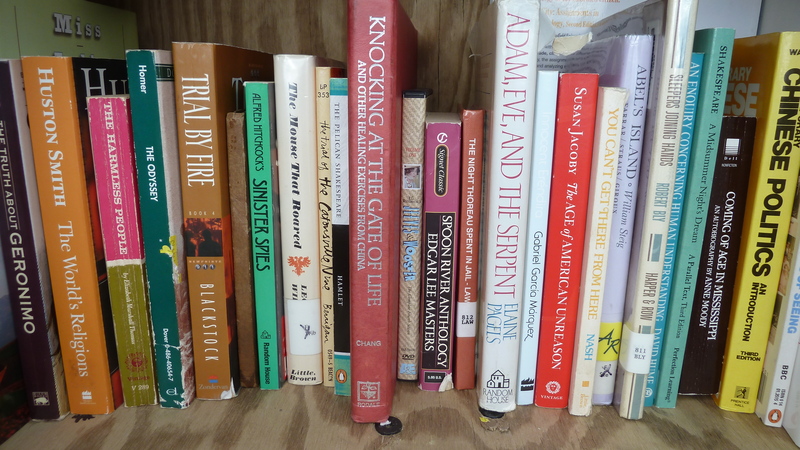 I also like to visit the local Booksavers shop just a short walk away, where I can get rid of or buy books cheap (and the money goes to support the world wide relief and development efforts of Mennonite Central Committee); but anyone can hop into the Booksavers online store here. That is such an enchanting idea! Encantado, right? I figured you’d hit it already … although truth be told there is not much there for kids, I don’t think. I saw the cute little library but never “slid the lock.” Now I’ll have to try it. Might have to contribute a book, also. 🙂 Yea books! We just don’t want to see a Blush in there yet — I guess! My bedtime reading tends to be casual, stuff that won’t keep me awake or wanting to keep reading. These were easy to put down as I got sleepy! 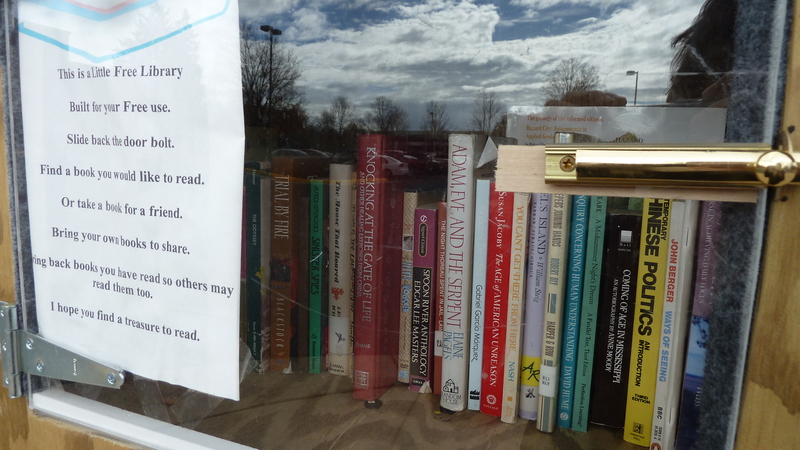 Okay… wheels churning… There’s a free library here in Boyertown… how can I encourage something like this without taking away from that community service? Libraries are free everywhere. Little Free Libraries do not compete with the public library system of the United States which provide SO MUCH MORE than just books to our communities (children’s programming, author talks, film screenings, internet access, tax forms, CDs, DVDs, online books, research accessibility, and on and on and on). Try a LFL and let your blog followers know how it goes than I can read your post about it on Abnormal Anabaptist. Well, then… I’ll have to give it a shot… 🙂 I have a basement and attic that is overflowing with books… I’m sure I can get a few together to start it..
Last fall a man came into my office looking for some Physical Plant, construction or repair work. He was in the graduate counseling program at EMU and needed to supplement his income. In the course of conversation he told me of the many places he had worked. Often doing volunteer work in various phases of construction for victims of disaster or those economically disadvantaged. I was impressed with his humble, gentle and genuine commitment to serve others. One day he approached me to advocate for some additional facility improvements on behalf of a visually impaired neighbor who he had been assisting to find her way to class. So when he asked to build a little library to share books for free, he had my attention. This was a person I felt could be depended upon to complete the project in a careful manner. I choose not to disclose his identity because I’ve not asked permission to do so but I do want to say he has gained my respect and appreciation. I’m so excited to have your response here, Eldon! A wonderful story on top of such a wonderful community addition. I’m … a little speechless (wordless?). Love it! And thanks for writing it all down. Knowing that not a lot of people come back to read comments like this, would it be ok if I shared it on the Facebook feed for this particular post? Or maybe I could do a follow up post sharing your story and what I’ve learned in this day since I posted about this little library It is ok, very ok, if you say no! Melodie that would be fine. You may wish to collaborate with Andrea as she is hoping to follow up as well. I love to catch people doing good stuff! My sister-in-law has one outside her house in Iowa. I borrowed a book from hers over the holidays and returned it to this one at EMU just last week. We were honored to host the man who started this one for Thanksgiving dinner last fall and, if I recall correctly, he said there’s another one somewhere in Harrisonburg. I love the Little Free Library connections! Brilliant idea, and I love reading all of the commentmas too! Thanks, Melodie. We had one only a few minutes walk from us in Toronto. Only had 15-20 books in it, but I loved the concept without realizing it was actually a widespread thing.